Adobe PDF is a highly customizable secure digital format usually used for writing ebooks and transferring/ embedding documents online . PDF files itself are smaller in size ,but if there are no images its better to convert them to text (TXT) files .PDF to TXT conversion saves some extra space and enables to copy the text in bulk . 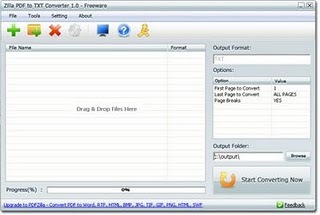 PDFZilla free is a freeware PDF to TXT converter for Windows . PDFZilla free PDF to TXT converter . PDFZilla is actually s commercial software for converting PDF files into multiple formats including Word ,Flash,PNG ,HTML etc . And this is only a module of the software which is free . Bloggers have a wonderful opportunity for grabbing the full version of this software by just writing a review . Download PDFZilla free PDF to TXT converter.